Senator Dianne Feinstein is arrogant, condescending, and will not debate Elizabeth Emken as the liberal Los Angeles Times has challenged her to do. 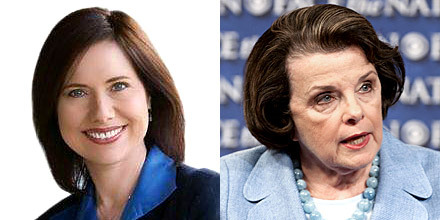 Feinstein can’t debate Emken because in a contrast of their policies Feinstein couldn’t win. The contrast between a rising star among the Republican party and a woman who has long overstayed her welcome would be immediately apparent after the first question was asked. Dianne Feinstein has been “TOO WRONG” FOR “TOO LONG” and she will be retired on November 6th. 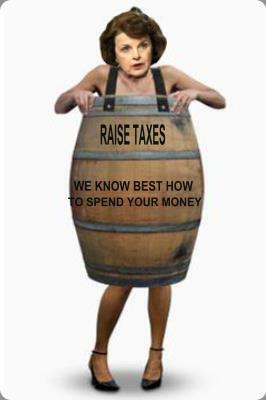 California voters have finally awakened to the fact that the tax policies of Senator Dianne Feinstein have contributed to a bloated burdensome federal government that works well for the 47% of tax payers paying no federal or state income tax, but have driven companies from the state to others with lower tax rates as well as overseas. 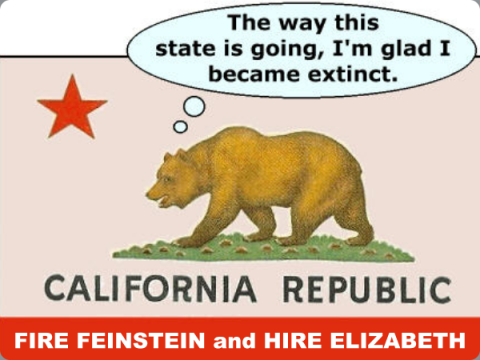 So disgusted with Feinstein’s policies even the California Golden Bear would like to leave the state. They have seen friends homes foreclosed upon, have experienced the humiliation of being terminated and unable to find meaningful employment. They also understand that the 79-year-old Feinstein’ for terms in the senate as she has the audacity to seek a 5th are largely to blame for the economic chaos in the entire country and the state of California. Emken will work for We the People as our Founding Father’s had envisioned. Feinstein never has and never will as she follows the progressives in her party. But underneath the headlines, the details show one indisputable fact: according to the Field Poll’s July 2012 survey, Feinstein’s numbers indicate she’s in real trouble. And that Elizabeth Emken, her Republican challenger, has a tremendous upside and a historic opportunity to defeat the most recognizable Democrat in California. • Feinstein barely broke 50% in a state where Democrats hold a 14% advantage in voter registration. • Feinstein’s approval ratings are under 40% in Orange and San Diego counties, the Central Valley and North State, as well as with No Party Preference voters, “Middle of the Road” voters, Asians, and young voters.